I'm pretending it is actually winter and thinking about comfort food. We had some fennel and I didn't have any interesting ideas. I found this recipe on epicurious and decided to go for it. Good call. It's pretty easy, thin sliced fennel and onion and garlic are cooked in some butter, then you make a creamy cheesey sauce, then layer it with potatoes and bake. It's delicious. Preheat oven to 375. Slice the fennel, onion and garlic very thinly, using a mandolin if you have one. Melt the butter in a saute pan, and cook the vegetables slowly until they soften. Sprinkle the sorghum flour over the top, stir and cook a minute, then stir in the milk and salt and pepper. Bring to a simmer and stir in the goat cheese. Layer the potatoes and creamy vegetable sauce in a small (or two small) casserole dishes. Bake 45 minutes to an hour, until potatoes are tender and the top is crusty and bubbly. 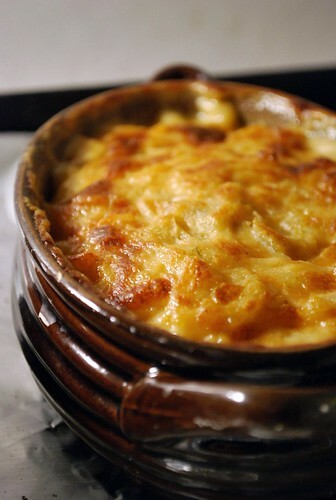 I could eat scalloped/gratin/tartiflette almost onece a week! Last night, in fact, I made a casserole of chopped lamb, onions, thyme for the filling and half spuds, half celeriac with lamb stock for the liquid. The celeriac was fantastic in this dish. Looks delicious! As far as we're concerned, it's winter here. (I'm in Dallas) It's been near freezing every night, and we had snow on Tuesday, so it's winter to me! holy drool that looks delicious! Don't have to wait for winter. 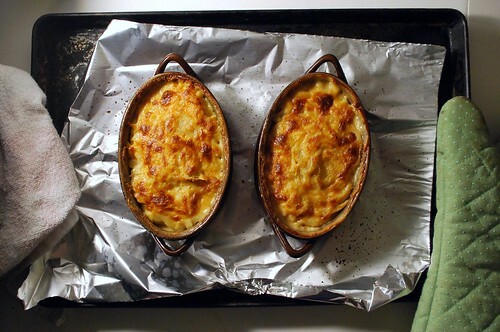 It's snowing here and that casserole looks mighty tempting and delicious. What, it's not winter??? It is seriously cold for Oregon right now. Hope it doesn't get worse once Winter officially starts. LOVE, LOVE, LOVE gratins. Working on a recipe for one myself, but must try this one too. Top quality mouth watering Food!! This looks really really good. But where do I get fennel? Is this something that a local grocery store will have, or will I have to go to a specialty market like Whole Foods? Jill, I LOVE your blog and have made your recipes for every family gathering to wondrous acclaim. Thank you so much for doing what you do!! I LOVE THIS! Have been reading for about two years now.